"Looking back at Labor Day's turbulent origins." "Monday, September 1, will mark the 120th celebration of “Labor Day” as a legal, national holiday. What is the history of the 'Labor Day' holiday? It had a turbulent, complicated beginning. Understanding more about this can help us to rethink the significance of this holiday today. "American labor in 1894 was a volatile force. The industrial revolution had radically transformed work, replacing skilled labor with machines, and giving birth to two powerful new institutions: factories and corporations. The economy had been rocked by deep depressions – 1873-1878; 1883-1886; 1893-1896 – when millions lost their jobs and millions more experienced wage cuts. Massive numbers of immigrants – an average of half a million a year between 1880 and WWI – arrived and applied for the low paid, dangerous unskilled jobs that were available. After the brief experiment in political and economic democracy called “Reconstruction” (1867-1877), the four million freed slaves, their descendants, and their northern relatives, found themselves stripped of their newly won rights, from the ballot box and the workplace to the school room and public transportation. Women’s suffrage advocates, who had hoped that the ending of slavery would quickly be followed by the extension of voting (and other) rights to women, were deeply disappointed. None of these developments took place without a struggle, and there were strikes, protests, marches, and rallies continuously in the last decades of the century..."
But why should Conservatives care if history repeats itself? And America has always been divided so who cares about Conservative propaganda? Conservatives can't be bothered by history...or biology...or anything that contradicts their underlying core "philosophy": serving the greediest and wealthiest among us. Cons look forward to Armageddon and to a New American Age of Feudalism. Combined with their anticipation of some sort of "rapture," we're all in a huge amount of trouble by not reading our history...for example, the history of organized crime. "In addition to what is considered traditional organized crime involving direct crimes of fraud swindles, scams, racketeering and other Racketeer Influenced and Corrupt Organizations Act (RICO) predicate acts motivated for the accumulation of monetary gain, there is also non-traditional organized crime which is engaged in for political or ideological gain or acceptance. 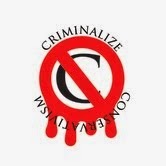 Such crime groups are often labeled terrorist organizations..."
When criminal organizations continue to get wealthy by exploiting the People it's time to criminalize those organizations. -- Joyce, Jnr.